£35 per head including an alcoholic or non alcoholic cocktail . I never liked mince pies. They were always far too sweet and claggy for my liking. That was until I tasted my friend Lucy's about 20 years ago. Now, THOSE mince pies were a total game changer. She very generously gave me the recipe which I have pimped and adapted over the years to these. They are bloody lovely, give them a go! Put everything apart from the alcohol into a large pan, heat gently for about 10 minutes until the butter is melted, stirring now and then. Allow to cool totally and then stir in your booze of choice. Beat together to a smooth constancy and chill. Put the flour, icing sugar, butter and orange zest into a processor and blitz until you have fine crumbs. Add the juice through the funnel and continue to blitz until it just forms a dough. Tip out onto a floured surface and form a ball, flatten slightly into a disc and wrap in cling film. Chill for an hour or so. Roll out the pastry to approx 3mm thick and cut discs to fit your tin (you'll need bases and lids). You should be able to get between 30 and 36 pies. Lightly brush your tin with a flavourless oil and line it with the pastry discs. Plop a teaspoon of mincemeat in each one, followed by a little of the cheesecake mix. Brush the edges of the bases with beaten egg and top your pies with the remaining discs, sealing them as you go. Brush the tops with beaten egg. Bake for 12 - 15 minutes until they are golden. Gently remove from the tin as soon as you get them out of the oven or they tend to stick. If you can resist them, allow them to cool until the centres aren't volcanic, dust with icing sugar. There is actually no time we love more than Christmastime. 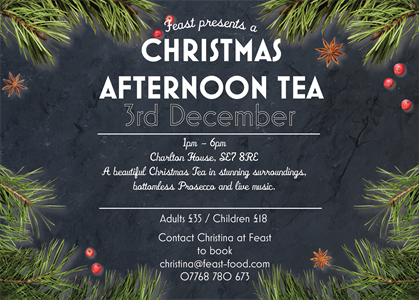 This year, to kick off the celebrations and to share some of our yummiest Christmas bakes, we’re hosting another one of our epic teas at Charlton House, SE7 on 3rd December. As well as a delicious extensive menu of sandwiches, savouries and sweet treats, we will also have live swing singers, The Dapper Dudes, to entertain and bottomless prosecco. These are just a few photos of some of the delicious plates that the extremely talented Stephen Kielty has recently served up at some of his tasting evenings. Steve is a Woolwich boy who just happens to be a 2017 Masterchef finalist and we're so excited to announce that Feast will be collaborating with him to host two, seven course tasting menus on Thursday 7th and Friday 8th September at Charlton House. Theatre of Wine will be supplying matching wines which you can buy on the night either by the bottle or by the glass. Charlton House stands proudly at the centre of our community in Charlton, South East London and has done for over 400 years. It is one of the finest surviving Jacobean manor houses in the country. The building illustrates a little-represented phase in the evolution of the English country house, linking the sprawling style of the Tudor age with the compact geometry associated with Inigo Jones. The original oak staircase remains, as do many fireplaces and plasterwork ceilings. This is a fantastic opportunity to have a look around the house and then enjoy a stunning seven course meal in the beautiful surroundings of The Old Library. We're super excited to be collaborating with the lovely people at Charlton House, hosting a yummy afternoon tea to celebrate Mother's Day. Our favourite singer, Elkie, will be performing, and, because we love a bit of fizz there are unlimited bubbles included in the price! Treat your mum, your best mate, or someone special to a great afternoon with us!